In November I traveled to Guatemala with Ryan Stimmel, founder of GoodTrip Tours, to scout out an itinerary for cultural immersion trips he will start running for families and educators this spring in partnership with Cambio NDG, a language school that benefits the Dutch/Guatemalan NGO Niños de Guatemala (NDG). Ryan has been taking groups to Cuba for three years but is now branching out to Guatemala due increasing uncertainty over Cuba travel for Americans. Guatemala is also a place he knows and loves – he lived there for four years during which time he started an after-school program for kids, taught university English and worked as a tour guide. I recently caught up with Ryan to get his thoughts on sustainable travel and learn more about his plans for GoodTrip’s Guatemala tours. Ryan talks with our NDG guide, Christian, at one of the chicken bus chop shops in Antigua. How do you define sustainable travel? It’s how to travel in a way you’re welcome the next time you go there. You meet people you keep in touch with; people who are excited to see you. You don’t damage the environment. I actually believe in leaving a “positive trace” instead of “no trace.” It’s about having both social and environmental conscientiousness. How does GoodTrip honor the principles of sustainable travel? And why? We partner with community leaders and local professionals. We ask them how we should behave, and we follow the advice. 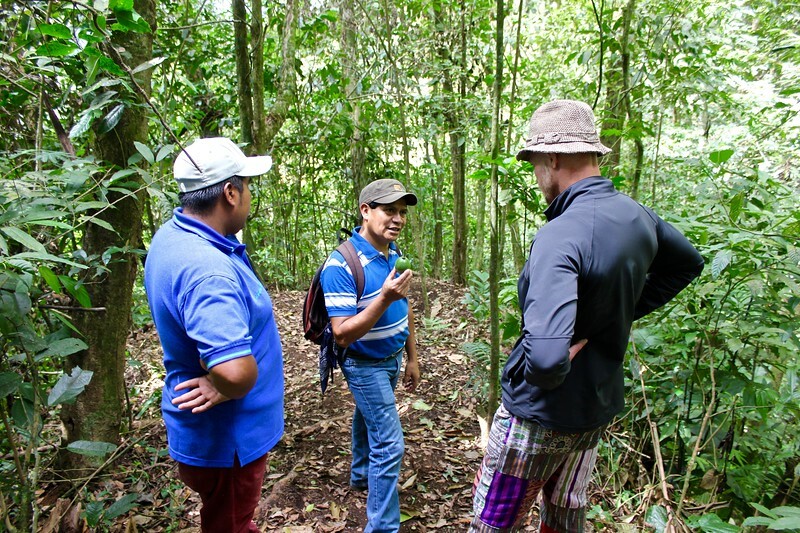 In Guatemala we’re working with Cambio NDG and The Labyrinth* – both organizations employ guides from local communities. They don’t look for established guides; they identify guides and train them. Our trips will have a community development component with NDG, and clients will be able meet with at least another NGO as well. * The Labyrinth is an Italian tour company, which runs sustainable trips to Guatemala and Belize. 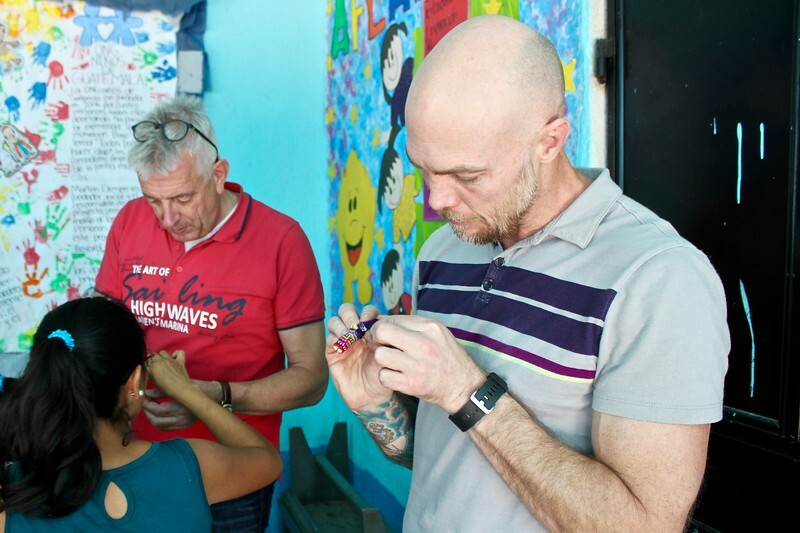 Ryan tries his hand at making a worry doll during a workshop we did at an NDG school with Dutch NDG supporters. Why did you chose Niños de Guatemala as a partner? 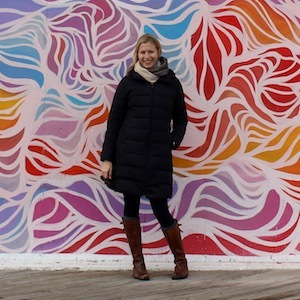 * Annemiek Dresen is a co-founder of NDG. She and Ryan were once roommates in Antigua. Why is Guatemala a good destination for sustainable travel? And there’s a lot of opportunity. It has a growing middle class and developing environmental leadership that is committed to conserving the country’s abundant natural resources – organizations like Defenders of Nature. But there are still challenges like conflict between poachers and conservationists in the national parks. What are you most excited about with the launch of your Guatemala tours? I’m excited by how much progress I’ve seen. The civil war left a power vacuum that allowed drug traffickers to take hold. It was rough to see the direction the country was going in. In the five years since I last visited, there’s been a drastic turnaround. I’m just excited to go back and talk to more people in depth. I want to find out, are they seeing things moving in the right direction? Who is working to create positive change? I want to meet more people doing good work – potential partners in community development and the environment. Ryan stands with his friend Miguel (far left), who works with The Labyrinth tour company, and one of his guides during our hike on Santiago Atitlán. What is GoodTrip doing in Guatemala that is different from other tour companies? Right now we’re the only company offering Spanish immersion for families with kids in elementary school. With us, you’ll travel through the destination instead of being a tourist – there are a lot of tourist traps to fall into, and we keep you away from that. There are still “touristy” activities like kayaking and mountain biking – but with us, you do it responsibly. People who are interested in the sustainability aspect will get a lot out of it, and others will at least get exposure. Either way, you’ll have a great trip and learn too. 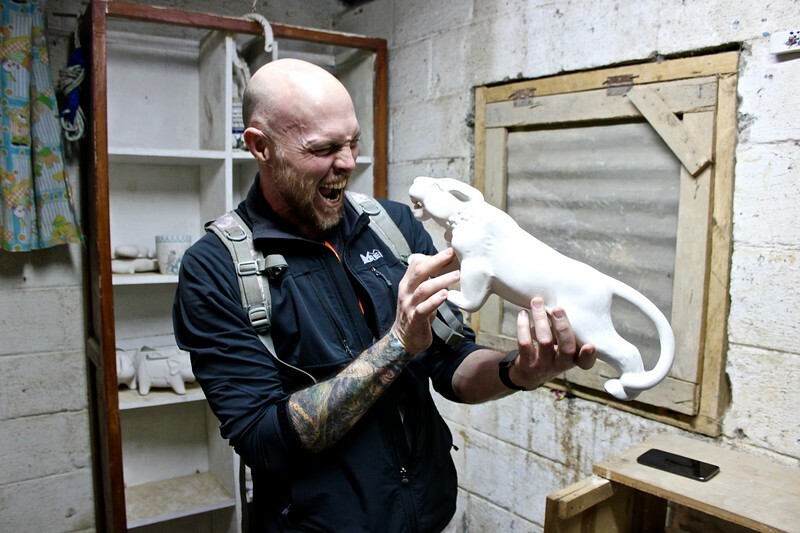 Ryan takes on a ceramic figurine at a traditional ceramic workshop in San Antonio Palopó. 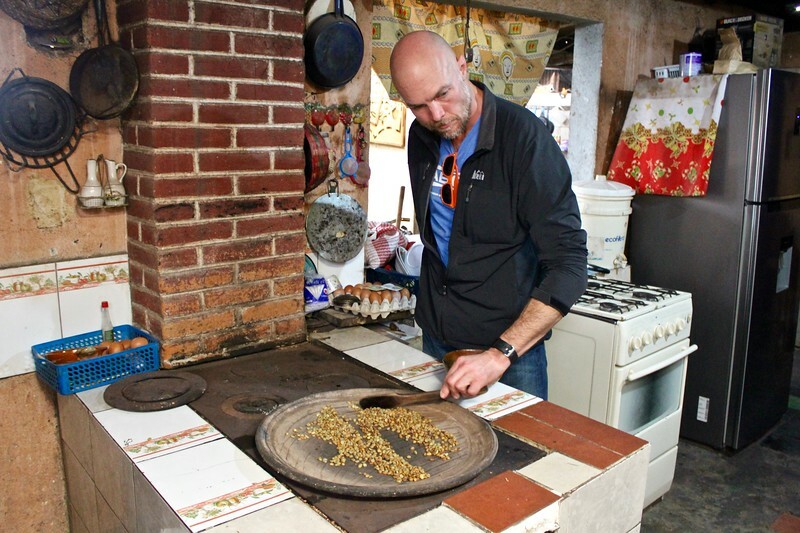 If you’re interested in traveling to Guatemala with GoodTrip, see the tours Ryan has available. 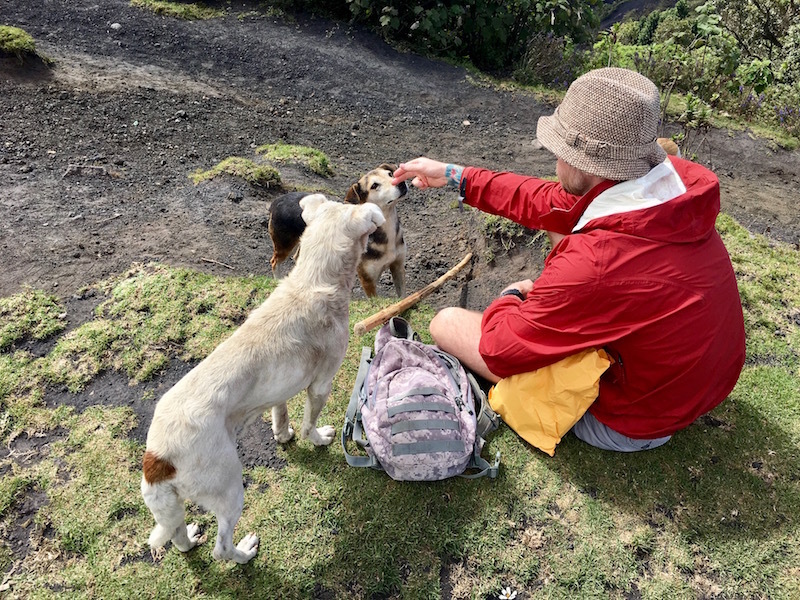 Banner image: Ryan befriends the trail dogs while hiking Pacaya. Thanks, Jenn and Ed, for reading! I really like the concept of a positive trace as well, and it’s something I hope to get closer to in the coming year. And the water filter definitely helps cut down on plastic water bottles!